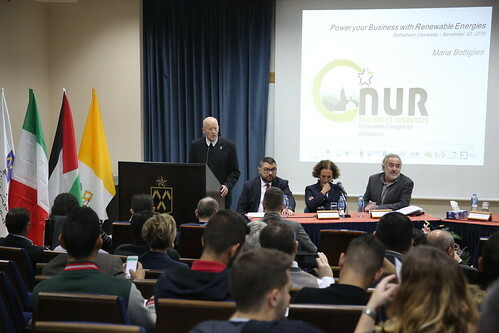 The New Urban Resources “NUR” project was launched at Bethlehem University on Thursday, 30 November 2018. The NUR project is the result of a cooperation agreement between Bethlehem and Turin municipalities and is co-funded by the Italian Agency for Development Cooperation for a 3-year period. Luigi Bisceglia, VIS Representative and coordinator of the MICAD program, welcomed the guests and gave a brief introduction on the project. Vice Chancellor Brother Peter Bray said this project is part of Bethlehem University’s vision to serve the Palestinian community. The University is the academic partner of this project. Brother Peter added that Bethlehem University is now working on establishing the Yunus Social Business Centre in coordination and partnership with Florence University in Italy. Professor Muhammad Yunus is a Nobel Peace Prize laureate from Bangladesh who contributed to poverty alleviation in his country by encouraging entrepreneurship. Brother Peter also praised the work of the Shucri Ibrahim Dabdoub Faculty of Business Administration to obtain international accreditation for its academic programs. Dr. Maria Bottiglieri, NUR project manager, gave a detailed explanation of the project and its expected outputs. Round table session entitled “Professional Skills for an endless energy” was held and it was moderated by Luigi Bisceglia. The NUR project will enhance and promote the increase of Renewable Energy Systems production in Bethlehem through PV plant installations both on urban and micro scales. It also foresees the implementation of training programs addressed to young people, on renewable energies and entrepreneurship, through the support of Start-Up enterprises in the field.